Week 7 of HighLowAha's Superbowl Snack Throwdown is upon us, and the black bean is the secret ingredient. Please make sure you go vote from now until 9pm (EST) on Sunday! But whatever method you decide to do, you will LOVE these. Seriously. Ryan ate a ton, and I didn't even bother cooking dinner because Patrick and I just keep grabbing them. The flakiness of the croissant coupled with the hearty chili is going to please everyone. They are sure to be gone before the coin toss! 1/2 cup shredded cheese - I used a Mexican blend, but you can use Cheddar or whatever floats your boat! Preheat your oven according to the tube of croissant dough. Unroll the croissants. With a sharp knife, cut each triangle in half length-wise so you have two long pieces of dough. Sprinkle the cheese at the wide part of each triangle, and top with a spoonful of chili. 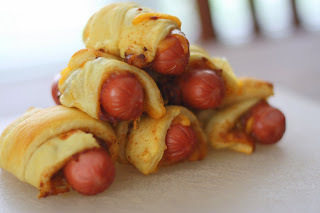 Place a mini hot dog on top of everything, and start rolling down towards the narrow end. This part might get messy! 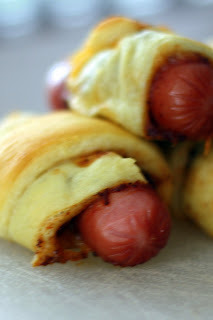 Place each little hot dog on a baking sheet, and bake according to the tube of dough. My girls would love these as a snack. These look great! My little girl would eat them up for sure! A THOUSAND Cheers for Babies!